Tired of optimizing your campaigns every day? Struggling with getting your conversion cost lower? We hear you, we feel your pain, and that’s why we are presenting Smart eCPA campaigns! 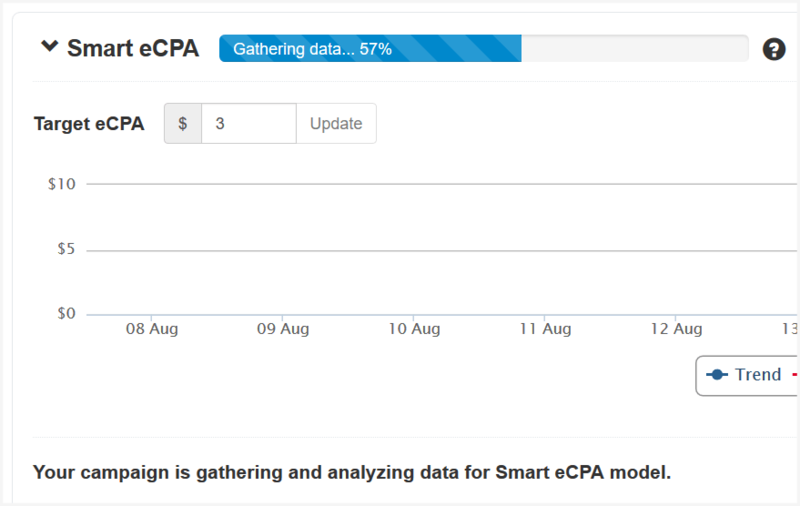 Smart eCPA is an AI-based technology which can do your optimization for you based on your eCPA goal. It practically allows you to run campaigns on the performance-based cost model. AI takes into consideration over 16 different parameters (including Device Model and Net Speed) and analyses the entire data range of each of them. For example, when you are optimizing subIDs one by one, tweaking the bid, pausing some targets, Smart eCPA is optimizing them all at once. It creates the level of optimization unreachable for any human being! Plus, it saves you a lot of time you can devote for getting new offers and running more campaigns. Run 1000s of campaigns at once and scale your media buying operation into a whole media buying network! Smart eCPA is available for Premium PPV RON, Source and Multi-Geo campaigns. Tight – we’ll aggressively blacklist targets and sources with low performance, which will allow you to save your budget at the beginning. Such choice tends to have a longer testing period and a lower amount of conversions in the end. Moderate – the regular blacklisting will allow you to keep more sources of traffic for the optimization in the future, while still saving your budget. High (Recommended) – only non-working targets and sources will be blacklisted. 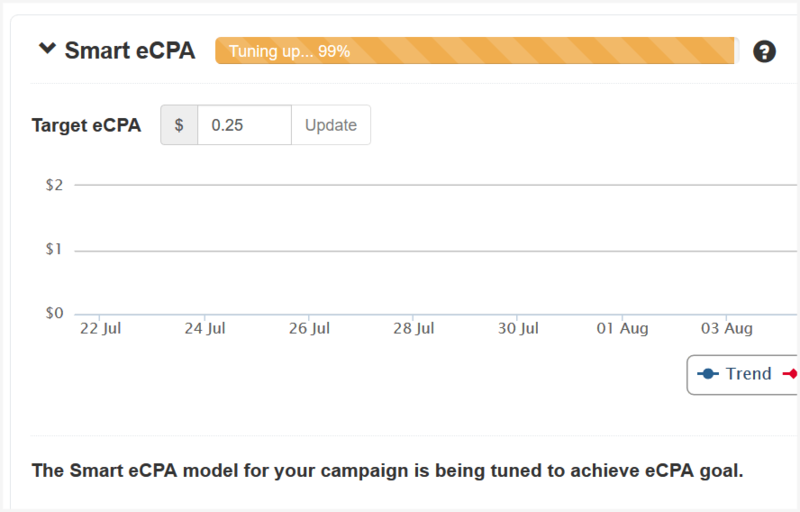 It will allow you to get more conversions in the future, as our AI algorithm can lower down eCPA up to 4 times compared to the testing period. However, it will cost you a bit more during the tests to cover more sources. Select your Target eCPA, in other words, the amount of money you want to pay for a conversion. 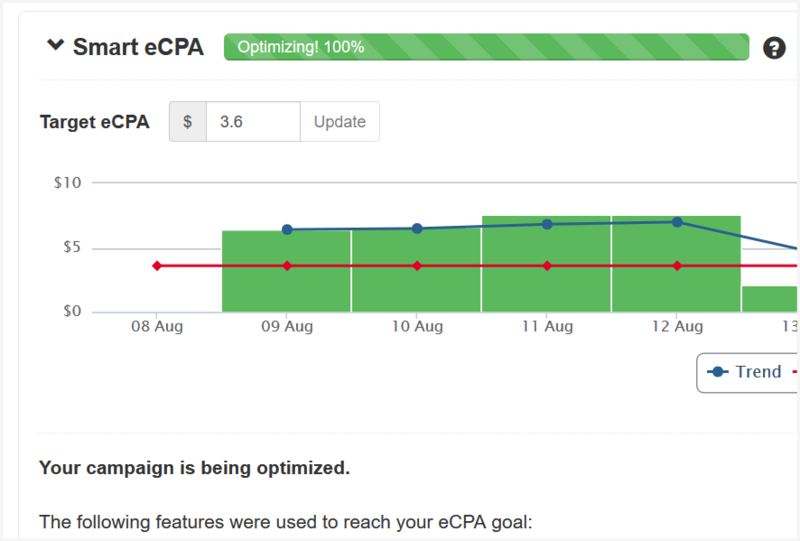 Pro tip: lower the eCPA, less amount of conversions we’ll be able to deliver, so try to set the reasonable goal! Continue with the regular campaign setup. Remember: Smart eCPA campaigns will work only with the proper conversion tracking. Keep in mind: The editing of Smart eCPA campaigns is limited, that’s why double check your settings before saving the campaign. Just like a media buyer, our system needs conversions to teach itself what to do. That’s why Smart eCPA campaigns require around 100 conversions to build a valid model. During the “Gathering data” stage only the basic optimization is performed. On this stage, AI is optimizing your campaign already, however it still requires some improvement to reach your eCPA goal. You have a valid model which is able to reach eCPA goal. The Smart eCPA starts working in full power mode. Time to relax and enjoy the results. All your Smart eCPA campaigns will be marked on the dashboard with the tag “AI”. It won’t be a problem to find them. The dashboard for Smart eCPA has also some differences. See how your campaign is performing in real time! Red line stands for the Target eCPA you have. If you change the Target eCPA, it will be reflected in the graph as well. Blue line stands for the eCPA of the campaign. You can see how the eCPA of your campaign is changing day by day. If you want to see the actual data on eCPA for the particular time period, you can activate the green line. You will see the columns, each of them reflects the eCPA of the campaign at any given time period. By default, it is inactive. On Smart eCPA campaigns you can see the sources and targets that brought you conversions. The only action you can make is to pause them in case of any fraudulent activity. We also added one more status: Paused by AI. Such sources and targets are unprofitable for the given campaign, and can’t be unpaused. How to make the most out of eCPA campaigns? AI algorithm will only work if you have one offer and one lander if any. You won’t be able to change the link for the existing campaign, but please, refrain from changing it in your tracker as well, as it will destroy the whole optimization. If you want to test another offer, please, create the separate campaign. Smart eCPA is not a magic wand, it’s the powerful optimization tool. Therefore, if the offer or lander themselves are non-converting, Smart eCPA won’t do much. Since we need at least 100 conversions to build the model, you should have a dedicated budget for tests. It doesn’t mean that it will be burnt down during the testing period, but the eCPA in the beginning may be pretty high. We wouldn’t recommend you to start the campaign without at least $200 you are ready to spend on the test of one offer. To figure out the exact amount, multiply your target eCPA by 100 – that’s approximate testing budget required. Make sure your daily budget is not way too low. Its amount influences the speed of the model creation and may slow down the optimization process drastically. The same goes for the wideness of the targeting. With the narrow targeting, it’s going to be harder to get enough conversions for the model, which might extend the testing period. Don’t quit too early! Even if you spend $1000 on tests and get only $250 back, we can still turn that around! When the model is ready, the CPA can be decreased up to 4 times! Zeropark Note: For more info on running Smart eCPA campaigns, refer to the Smart eCPA Best Practices article. Optimize your campaigns without any effort! Try Smart eCPA!